Nottingham City Transport (NCT)’s fleet of 53 biogas double deck buses will more than double in size this year, as a further 67 join the City Operator of the Year’s fleet. NCT has been successful in securing a further £1.12m from OLEV (Office of Low Emission Vehicles), which will be used to expand its bio-methane refuelling station at its main bus depot. Expanding the renewable natural gas (RNG) refuelling station is necessary for NCT to be able to fuel more gas buses and this funding announcement paves the way for NCT to confirm its order for 67 more biogas double decks, representing a total investment by NCT of £20m. The first of the 67 buses will enter service in April. It is expected all 120 biogas buses will be running by November, enabling NCT to begin retiring its oldest buses (pre-2010). Gary Mason, NCT Engineering Director said, “With 53 biogas double deck buses already successfully operating in Nottingham and making a significant impact on reducing emissions in the city, this announcement for funding to expand our gas refuelling station paves the way for investment by NCT in a further 67 biogas double decks to join the fleet this year”. 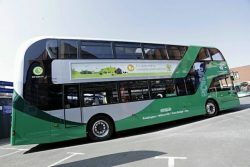 Biogas double decks are the greenest buses on the road, with well-to-wheel emissions that are 84% lower than an equivalent new diesel double deck, NCT said in its press release. With 120, more than half the NCT double deck fleet will be fuelled by RNG by the end of the year.